To participate, your team must submit a one page application describing your concept and team qualifications. Ten teams will be chosen, and will be sent a TPad Phone. You will have several weeks to write and test your applications before presenting your work at the World Haptics Conference in Evanston, IL, USA to conference attendees and a jury. At least one presenter will be expected to attend the full conference, and will be responsible for applicable registration fees. 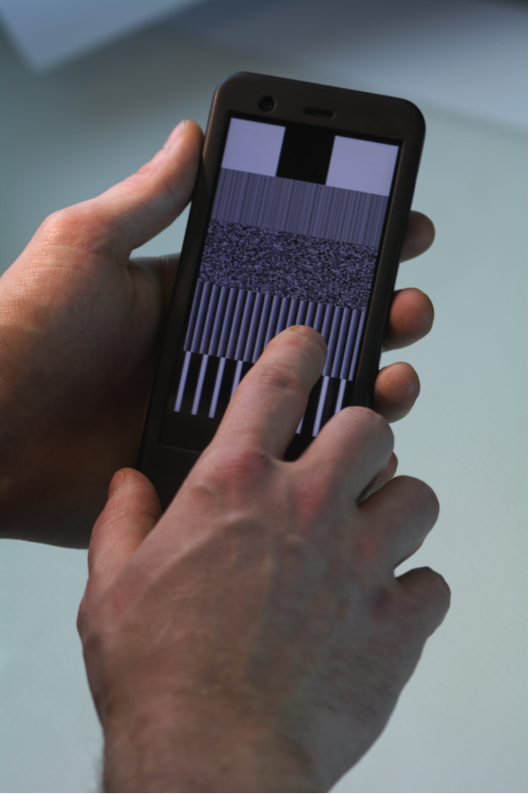 The TPad Phone is a variable friction haptic display on an Android smartphone. It uses ultrasonic friction-reduction to change the resistance force on your finger as it slides around the screen. This effect can be used to create perceptions of texture, shape, and dynamics. More information on the details can be found at www.thetpadphone.com and www.tpadtablet.org. Participants will create an Android application for the TPad Phone that attempts to solve some real world problem. The variable friction display must be a significant part of your application, but you may also use any other capabilities of the TPad Phone, and may use it to connect to other hardware or web services. Useful complementary components include the vibration motor, accelerometer, front and back cameras, Wifi, Bluetooth, and GPS. To enter the challenge, a team must submit a single page description of their concept, including a 150-word written description as well as a wire frame or sketch. Each team member should also include a short statement of what experience they have in haptics or software, and 1 or 2 samples of previous work. The challenge is open to both undergraduate and graduate students. Teams may have between 2 and 4 members. Teams are free to enlist professors, teachers, and professionals as advisors, but the work must be done by the students only, and all team members must be students at the time of submitting the application. There are many possible applications of variable friction haptic displays. For example, one compelling problem is to make applications more accessible for people with visual impairments or for people in situations where vision can’t be used. However, don’t let your creativity stop there. Haptics can also improve the experience of an interaction that is primarily visually or audibly based with increased expression or better feedback. A good submission will address a real world problem in a creative way. What problem you are trying to solve, and why it is important. Why haptics, and variable friction in particular is a good solution. What your app will do and how people will interact with it. How your skill set will contribute in your team. Past results in time constrained situations. Good design requires iteration, and we don’t expect your final app to be exactly as you described in your submission, but your concept description should be well thought out, and should have a plausible chance of working. Submissions are now closed. If you are interested in the Challenge, please enter your name and email address here, and we will keep you updated on everything Student Challenge related. As we have very limited funds to support student travel, students are highly encouraged to raise funds to support their own travel expenses. Possible sources include local companies, and the department or dean’s office at your university. Additionally, three $1000 travel grants are being made available to accepted teams to help students defer travel costs. Travel grants are considered separately from the main application, and on the basis of need. Travel grant applications will be available on April 20. Below is a short YouTube video playlist introduction to the TPad Phone. It covers the basics of what it is and what it can do so that you're ready to get hands-on and create your own haptic effects. Using the TPad Phone requires programming an Andoid application. We suggest using Eclipse as your IDE, although Android Studio is also an option. We've put together a step-by-step guide to everything you need to have on your computer in order to get started with programming the TPad Phone in Eclipse. #5 Debugging Java code with Logcat (8min). The best way to get started programming is to download and compile the HelloTPadPhone app. It contains the main methods used to control the TPad. The source code for this, as well as the source code for other TPad Phone applications is at https://github.com/TPadTabletProject/TPadSoftware. Teams will submit compiled versions of their applications along with a 150 word description and 1 minute video by 11:59 pm PST June 19, 2015. The video should briefly explain the problem being solved, and show the application in action. Awards will be presented to the top submission of each of the three categories below as chosen by the jury panel. Each member of each winning team member will receive a Microsoft Surface Pro 3. Additionally, a $1500 cash prize will be awarded for the “overall best interaction”, a $1000 cash prize for the “people’s choice” as voted on by conference attendees, and a $500 cash prize for honorable mention. Jurors will represent both industry and research, as well as the design and visually impaired communities. A special demonstration time will allow jurors to interact and try the applications in person. Additionally, we are taking advantage of the nature of the hardware by introducing mobile demonstrations. During the conference, student innovators will carry their demos with them. We will make announcements and provide t-shirts so that people know to look for you and can find you in the crowd. Teams are encouraged to make the apps available to conference-goers as much as possible during breaks, meals, and other in-between times. This is a great opportunity to meet and start conversations with potential future research advisors or employers. Q: Do I own the intellectual property and source code? A: Absolutely, you own anything you develop. Q: Can I publish a paper resulting from this? Q: Can people outside the team help me develop the code? A: Help on things like debugging, sample code, and learning Java is completely fine. Only team members are allowed to write large pieces of code. The only exception to this is that you are permitted to incorporate free and open-source software and free APIs. Q: Can my advisor help? A: Advisors can advise, but the core ideas and decisions should come from the team members. Q: Do I get to keep the TPad Phone? A: Yes. If you want to keep the TPad Phone for further research, it's yours to keep. Q: Can I just take an application that already exists and add haptics to it? A: Similar to how academic papers are refereed, we are looking at your particular contribution- what you are adding to what existed before. Don’t reinvent the wheel, but having a great app and then tacking on haptics as an afterthought is not a winning recipe either. We want your focus to be on solving a problem through haptics. Use your best judgment, and keep in mind that one of the judging criteria is originality. Q: Does everyone on the team have to come to the conference? A: At least one team member must attend the entire conference, but we encourage everyone to come. It’s a good conference. It’s worth it. Q: If we have less than 4 team members, do we still get 4 Surface Pro 3s? A: No. One Surface Pro per team member.